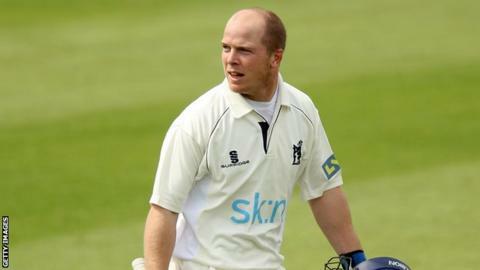 Warwickshire wicketkeeper Tim Ambrose may miss the rest of the season with a freak thigh injury. Ambrose, 29, suffered the injury during the Bears' CB40 semi-final win over Lancashire and may now miss the final against Hampshire at Lord's. "He was sitting on the balcony and went to move his leg which was in a raised position," Bears captain Jim Troughton told BBC Coventry & Warwickshire. "Hopefully it's not as bad as he thinks it is." Former England international Ambrose has been a key member of the Warwickshire side closing in on the County Championship title, as well as reaching the CB40 final for the second time in three years. And Troughton is hopeful that Ambrose will be able to take some part in the closing stages of the season. "Hopefully the scan will be positive but it's a hard one to swallow." Fellow wicketkeeper Richard Johnson, in his second stint on loan at Derbyshire, was recalled earlier in the season following a previous injury to Ambrose.